We are constantly told that improving energy efficiency is the key to an effective energy policy, but the truth is that it is an essentially meaningless goal. The direct cost and the indirect (environmental, societal, etc.) costs vary greatly between energy sources, so the importance of efficiency also varies. There may be good reasons to reduce use of coal (air pollution) or oil (oil imports) – but if we can supply energy at low cost and with little environmental impact (space-based solar power comes close), why should we care how much of it people use? The solar radiation falling on the Earth is 10,000 times greater than the total energy used by humans. If the Earth were a black body, our current energy use would increase the temperature by 0.007 deg C – but in fact there are feedback mechanisms that stabilize the temperature, so the real temperature rise is much less than this. We have a long way to go before we need worry about direct planetary heating from energy use. The claim that we must reduce use of all kinds of energy stems from the environik fantasy of a future in which we all live frugally in modest, wind-powered cottages among the trees, cultivating our little organic gardens, using only small-scale technology, and celebrating our solidarity with all creatures, great and small. This pastoral idyll cannot happen, because this kind of agriculture cannot support the present or future world population, and because a hand-ax or a screwdriver implies the existence of Pittsburgh. These idiots dream of a kind of worldwide Vermont, but the reality would be more like a slum in Bangladesh. The annual global consumption of marketed energy has increased by a factor of 25 since 1900, and now stands at 500 quads (1 Q = 10^15 BTU = 2.93 X 10^11 kWh). Although energy intensity (energy used per dollar of GDP) has been decreasing everywhere, the world will need at least 3000 Q/year by the end of this century. Energy policy MUST be directed to finding within a few decades ways to generate an order of magnitude more energy than the human race uses now, at affordable cost and with minimal environmental impact. In the longer term, we may need thousands of times more energy. The next post offers an example. I don't object to improving energy efficiency if in a particular instance it saves money or reduces environmental, impact, but it is a trivial distraction from the real problem of supplying energy. A simple solution to the illegal immigrant problem: Pay illegals to report their US employers. If an illegal worker reports his/her US employer to ICE, fine that employer $100,000 for every illegal employed. Deport all the illegals employed there -- but pay $100,000 to the one who filed the report. Inform all the deportees that if they are found illegally in the US again, they will spend 2 years in prison. This would create a competition among illegal employees to be the first to report the employer, and therefore to go home with what amounts to a fortune in Mexico. This might lead to a temporary influx of illegals who come here with the specific intention of getting a job and immediately ratting out the employer. However, employers would soon learn that any illegal hired would be very likely to report it immediately to ICE, leading to a crippling fine. So the jobs would soon dry up, removing the principal incentive for coming here illegally. This program would cost the taxpayers nothing, as it would be funded entirely by employer fines. On May 19. Craig Venter announced that his team at the Venter Institute in La Jolla had succeeded in creating synthetic life. Why has this attracted so little attention? Venter became famous a decade ago because he was frustrated with the slow progress and high cost of the NIH Human Genome Project, which began in 1990. In 1997 he founded Celera Corporation, which did the job in 3 years at a cost of $300 million. The government-funded effort took 13 years, finishing in 2003, and cost $2.7 billion. (1) They sequenced the genome of the bacterium Mycoplasma mycoides (which causes lung disease in goats). Its DNA has 1.08 million base pairs. (2) Starting with the chemicals adenine (A), guanine (G), cytosine (C) and thymine (T) which make up the genetic code, they synthesized stretches of DNA corresponding to segments of the M. mycoides DNA and then managed to get them all to hook up in the right sequence. Thus they constructed from scratch a copy of the bacterium's DNA. (3) They inserted this synthetic DNA into a different bacterium, M. capricolum, which had had the genes for its restriction enzymes removed (which means that it had no defenses against foreign DNA). The synthetic DNA took over, and the cells started reproducing and behaving just like natural M. mycoides. A good way of looking at this is that they have taken the cell machinery ("hardware") of M. capricolum and replaced its software (the DNA), which tells it what kind of creature it should be. Having a cell "boot up" with entirely artificial software is an astounding achievement. There is now a live bacterium in La Jolla whose genetic code was not determined by evolution but by typing it on a computer. This is the first unequivocal example of Intelligent Design – but the Intelligent Designer was Craig Venter, not God. In my opinion, there have been five major revolutions in human society: the Agricultural Revolution, the Industrial Revolution, the breakout into space, the computer revolution, and now the creation of artificial life. This is HUGE. In this first test, the team copied natural DNA, but now they can begin exploring variations, perhaps producing wholly new life forms. A major goal is to understand what features of DNA are essential for viable life. Venter's company, Synthetic Genomics Inc., hopes to start producing designer bacteria that can do things like making fuel from algae or cleaning up oil spills. It is a long way from synthetic bacteria to synthetic differentiated creatures (e.g., living androids), but the way is now open. It will happen sooner than we expect. We need to start thinking about the ethical implications. An interesting sidebar is that all DNA has long stretches of base pairs ("junk DNA") with no known function. Although some of it surely does things we don't yet understand, it appears that you can add arbitrary segments without affecting viability. There are 256 ways to choose the 4 bases in a stretch of four, so you can use combinations of four base pairs to represent letters, punctuation, etc. Venter & co devised such an alphabet, and included quite a bit of text in their synthetic M. mycoides. The information includes the following quotes: "TO LIVE, TO ERR, TO FALL, TO TRIUMPH, TO RECREATE LIFE OUT OF LIFE." - JAMES JOYCE; "SEE THINGS NOT AS THEY ARE, BUT AS THEY MIGHT BE.”- J. ROBERT OPPENHEIMER; "WHAT I CANNOT BUILD, I CANNOT UNDERSTAND." - RICHARD FEYNMAN. We need an international agreement about the code used to include text in synthetic DNA, and a requirement that it include info about its origin (so that any life that escapes control can be identified). Incidentally, the human genome has 3.3 billion base pairs, and 96% of it is thought to be junk. This suggests that you could encode the St James Bible four times over in a strand of human DNA, and still have it work to create a human being. President Obama's new direction gives the coup de grace to NASA's moribund human spaceflight program, although he tried to mollify space buffs by a few vague comments about a mission to an asteroid Real Soon Now – i.e., in only 15 or 20 years. In other words, he proposed a project that would not start until well after he is out of office, so funding it can be some future President's problem. He did not specify which asteroid, so I suggest that we designate it by the Greek letter pi. This will allow us to call the project by its rightful name, as the Pi in the Sky Program. Obama says that development of the Orion spacecraft (an Apollo Command Module on steroids) will continue, so that it can be used as a lifeboat attached to the International Space Station (ISS). This is an asinine make-work project, spending billions on an emergency escape capsule, grotesquely over-designed for the job, that will probably never be used. It is like saying that a freighter with a crew of six people needs a luxury motoryacht as a lifeboat. After the retirement of the shuttles this year, there will be nothing for NASA pilot astronauts to do. Americans will be passengers on the Soyuz, piloted by a Russian (at a ticket price of $56 million), or on a private vehicle, piloted by an employee of SpaceX (or another private launch company). There is no justification for more pilots on the ISS, since it simply sits there. The dominance of pilots as astronauts has been in decline for years. Note that Al Shepard's old job as Chief of the Astronaut Office is now held by biochemist Peggy Whitson. She flew on Expedition 5 to the ISS in 2002 and was ISS Commander on Expedition 16 in 2007, and she has more time in space (376 days) than any other US astronaut. She completed 5 EVAs, for a total time outside of more than 32 hours. So much for the claim that only male pilots have the Right Stuff. The ISS is now supposed to remain operational until 2020. There may be an occasional job there for a Mission Specialist (i.e., somebody who knows a lot about ISS systems), but the principal need will be for Payload Specialists. These will not be NASA astronauts but scientists who spend a few months in training (mostly in Russia), fly their experiments, and then return to their labs at universities. The harsh reality of the Obama policy is that keeping the astronaut office open and the various training facilities running is now an unjustifiable waste of money. With no need for pilot astronauts for the next decade or two, NASA will have to sell the fleet of T-38s and either mothball the simulators or offer them for rent to Elon Musk at SpaceX. If I were a NASA pilot astronaut, I would now be rushing to get my resume to Elon ahead of the crowd. There are two underlying reasons for this sorry debacle. The first is that, since NASA's inception in 1959, the engineers in middle management have suffered from the delusion that the only real purpose of spaceflight is to test spacecraft (in contrast to everybody else, who think that the purpose of spacecraft is to enable spaceflight). This means, for example, that they thought the real objective of Project Constellation was not to learn more about the Moon but to build and test new hardware, so they did not understand that repeating Apollo 50 years later would make the agency an object of ridicule. The second reason for the failure is that, as Chris Kraft once said, people at Johnson believe that "being in charge of manned spaceflight is their birthright." NASA has always preferred controlling a small, pointless human spaceflight program, going nowhere, to playing a supporting role in a healthy, growing program, funded by investors rather than taxpayers. Until recently, NASA has been quite effective in sabotaging potential competition. These pathological attitudes led NASA into a series of colossal blunders, starting with the decision to build the shuttle in 1972. Instead of learning from that disaster, NASA compounded it by rejecting the Industrial Space Facility (proposed by Max Faget and Joe Allen) in favor of the monstrous white elephant called the ISS. They did it again in 2004, by committing to Project Constellation. It is very sad to see the death of the program for which we had such high hopes when Neil Armstrong announced that the Eagle had landed. I have however given up any expectation that reforming NASA can make it an aid rather than an impediment to the expansion of our civilization into the solar system. We will eventually need a government role in exploratory missions beyond cislunar space, but we can hope that if the present organization has been dismantled we can start over with a new one that is happy to accept its proper role in support of private enterprise off Earth. The conclusion is that President Obama's new program will be a painful but apparently necessary catharsis. It is however very disappointing that he has made no provision for the two projects that hold the key to our future as an interplanetary species. He talks of building a heavy-lift expendable launch vehicle (ELV), but there is no need for that capability in his plan for NASA. We will surely want heavy lift sooner or later, but it is absurd to design such a vehicle without knowing what we will use it for. Moreover, using today's technology guarantees that it will be obsolete long before it flies. What we really need are (1) a two-stage reusable launch vehicle (RLV) with a payload to low Earth orbit of 20 to 30 tons, and (2) a serious commitment to sunsats – i.e., space-based solar power. Sunsats can provide unlimited clean, inexhaustible electric power anywhere on Earth. The economies of scale in any significant sunsat deployment mean that launch costs will decrease from the present level (around $10,000 per kg of payload to low Earth orbit) to less than $400/kg (using RLVs). The implication is that the cost of power from a sunsat can be quite competitive with current terrestrial sources such as gas-fired or nuclear plants (and much cheaper than terrestrial solar power). The cheap marginal launch cost, available to everybody, will lead to exponential growth in other commercial space operations. NASA and DoD will benefit as well, allowing them to do much more in space within limited budgets. There are no technical showstoppers to development of RLVs and sunsats. NASA could help (e.g., by supporting development of suitable reusable rocket engines), but the most important requirement is assistance in reducing the financial risks (e.g., by guaranteeing the market for an RLV). With a quite modest investment, the Administration could (1) eliminate US dependence on foreign oil; (2) do far more to limit CO2 than any cap-and-trade program (if anyone still thinks that is important); (3) solve the global energy problem once and for all; (4) eliminate global water shortages by enabling cheap desalination of seawater; (5) increase food supply by enabling cheap greenhouse agriculture under rectennas; and (6) open the solar system as part of the human domain. That's a truly colossal bang for the buck. I need to talk to Lori Garver about this. She was Executive Director of the National Space Society a few years after I was President of its predecessor, the L5 Society -- but I am sure she shared these goals. She was Obama's space advisor during his campaign and she is now Deputy Administrator of NASA. Stu Roosa was the Command Module Pilot on Apollo 14, and I was the Mission Scientist. In early 1970, during the discussions of the best landing site for the mission, Stu and I proposed and fought for locations toward the western limb of the Moon. We lost this battle because the consensus was that Apollo 14 should be sent to Fra Mauro (3.6oS, 17.5oW), where Apollo 13 was supposed to have landed. This site was favored because it is on the ejecta blanket from the magnificent Copernicus crater. My favorite western sites were the crater Grimaldi (at 5.2oS, 68.6oW), and Rima Sirsalis, a rille (i.e., a linear trough) that begins at the crater Sirsalis (5.7oS, 61.7oW) and runs in a direction west of south to the crater Darwin (19.8oS, 69.1oW). I could make a good argument for these sites – but Stu and I also had an ulterior motive that we could not reveal without being ridiculed. The launch in June 2009 of the Lunar Reconnaissance Orbiter (LRO) persuades me that I should now come clean. Grimaldi was interesting because it is one of the places where observers have reported Transient Lunar Phenomena (flashes of light or brief episodes of haziness in the crater, possibly due to volcanism). Unfortunately, we had no photographic evidence of these events, and the anecdotal reports were not given much credence in the lunar science community. In retrospect, Grimaldi would have been a good choice for a lunar landing: observations from later Apollo missions and from Lunar Prospector in 1998 have detected emissions of radon in the vicinity, and there appears to be a mascon (mass concentration) under the crater. This suggests that it was formed by the impact of a dense asteroid that is still buried there. The relationship between this and the apparent gaseous emissions is an interesting question. Rima Sirsalis is more than 350 km long, making it one of the longest rilles on the Moon. It averages 3.7 km wide and 230 meters deep. In 1970, the prevailing theory was that rilles were collapsed lava tubes, but it was hard to force this rille into that model because lava flows down hill and this one runs up and over mountain ranges. Here again, later observations have made Rima Sirsalis more interesting than we knew. There is an unexplained linear magnetic anomaly associated with the rille, so that the surface field there is the strongest on the Moon (although still weak in comparison with the Earth's field), and there is also a strong gravity anomaly nearby. This is the question Stu and I had asked ourselves: if alien spacefarers had visited the Moon some time in the past, and wanted to make contact when the primitive life on Earth had evolved into something interesting, where might they have left some indication of their presence for us to find? Of course we did not believe in the alien monolith in the 1968 Clarke/Kubrick movie 2001: A Space Odyssey, but alien artifacts on the Moon were not (and are not) totally impossible. The answer to the question seemed obvious: Mare Orientale, which is a vast multi-ringed crater centered at 17.5oS, 81.6oW, stretching across the western limb. The outer ring of mountains, called Montes Cordillera, is 930 km in diameter. The tallest peaks are 30,000 feet above the central basin, higher than Mt Everest is above sealevel. There is nothing remotely like it anywhere else on the Moon. The eastern mountains can be seen in profile from the Earth, especially at maximum lunar libration (the small rotation of the line of sight from the Earth because of the eccentricity of the Moon's orbit). Earth-based observations as early as 1871 suggested that these mountains surrounded a large crater, but we didn't have a good picture of it until 1967, when NASA's Lunar Orbiter 4 returned this photo. The grey splotches on the Moon are called maria (Latin for 'seas") because that's what Galileo thought they were when he first saw them with a telescope. If the Moon were rotated 80o relative to the Earth, Orientale would be the most obvious naked-eye feature, a giant bullseye with a diameter nearly one third of the visible disc. Early observers knew nothing of asteroids and impact craters, so Orientale might well have seemed artificial, leading to the conclusion that there was a civilization on the Moon capable of construction on this astonishing scale. The possible effect of that on the intellectual development of our species is an interesting subject for speculation. From the aliens' presumed point of view, Orientale would be a good place to leave a marker. It provides an unmistakable focus of attention, but we creatures on Earth would not know about it until we achieved spaceflight. In order to ensure that surface features had distinct but not too elongated shadows, making them easier to see, the mission rules required that Apollo landings occur in the lunar morning, when the Sun was between 5o and 13o above the eastern horizon. The implication was that Orientale would be in darkness throughout the Apollo 14 mission unless the landing site was farther west than about 50oW. If we had pointed this out, and explained why Stu wanted to take photographs of this particular feature from orbit, we would have been dismissed as science fiction nuts. As it turned out, the Apollo 12 landing site was the farthest west, at 3.0oS, 23.4oW, so none of the Apollo crews saw Orientale in daylight. 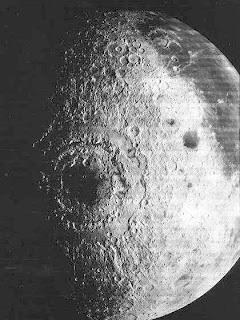 The Clementine mission in 1994 obtained some pictures, but the resolution was tens of meters, insufficient to reveal a reasonably sized artifact. However, NASA's Lunar Reconnaissance Orbiter (LRO) is now in polar orbit around the Moon, at an altitude of only 50 km. The two LRO narrow-angle cameras image a swath 5 km wide with a surface resolution of 0.5 meters/pixel! LRO was intended to survey landing sites for Project Constellation (the return to the Moon), and to look for ice deposits in shaded valleys at the poles. I thought the mission architecture chosen for Constellation was a serious mistake, so I am not sorry that President Obama has canceled that program. I am however glad that he didn't get around to that decision before LRO was launched. Nobody has told it that its principal justification has gone away, so it is still up there, patiently returning images. A truly remarkable feature of this space mission is that NASA has set up a website where anybody can specify locations for high resolution pictures. It may take up to a year before LRO passes over your chosen spot, but you will be notified by email when it does. In memory of Stu Roosa, who died in 1994, I have selected several promising locations for hi-res images in Orientale. Of course I don't actually expect to see an alien artifact, but it is surely worth a look. Apart from all other issues, it is already clear that imposing CO2 emission limits in the Annex 1 (advanced) countries is a futile endeavor. Emissions from countries that are exempt from these controls are rising rapidly, especially from Asian countries that have enjoyed vigorous economic growth during the last decade. To illustrate, the upper two curves in the figure show the recent history of the CO2 emitted due to energy consumption in the Organization of Economic Cooperation and Development (OECD – i.e., the advanced countries, excluding Mexico and South Korea since they are not Annex I countries), and in the rest of the world. * If current trends continue, emissions from the exempt countries will be twice those from the OECD in less than a decade. The lower curves show the CO2 contributions by the United States and by China and the former members of the Soviet bloc. Note that the economic collapse of the Soviet bloc in 1990 led to a substantial reduction in emissions, so that including some members of this group in Annex 1 is nothing more than a sham, enabling them to pretend that they are working diligently to meet their Kyoto targets. The real economic growth rate in China was an astonishing 13% p.a. in 2007, and it was still 9% p.a. in 2008, despite the worldwide recession. In order to accommodate this growth, China has undertaken a crash program to build electric power plants. The annual increment in capacity peaked in 2006 at 110,000 MW (a figure that exceeds 10% of the present total US capacity), and more than 90,000 MW of the new plants were coal-fired. The deployment rate has declined to around 75,000 MW per year, but will presumably accelerate when the recession ends. 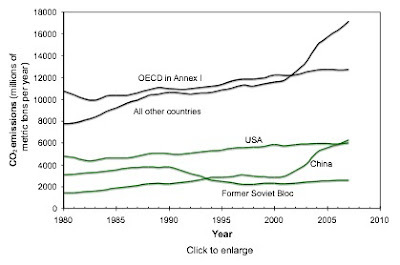 As a result of this growth, Chinese emissions are now greater than those of the USA, and they are responsible for 60% of the present rate of increase from all the exempt countries. Several of these countries, including China, and India, have categorically refused to slow their economic progress by undertaking any steps to limit emissions of CO2. In the absence of such commitments, strict regulatory regimes in the advanced countries are a waste of time and money. Moreover, the reliance on a substantial, artificial increase in energy prices is a fatal flaw that makes the proposed remedies counterproductive in terms of their stated goals. The difficulty is that abundant cheap energy is the sine qua non if we are to deal with all the other human, societal and environmental problems facing the planet. In particular, high energy costs will severely inhibit economic growth in the poor countries, perpetuating their disastrous population growth rates. UN forecasts suggest that the number living in abject poverty could triple by 2100. Apart from humanitarian issues, this growth will inevitably increase the output of CO2 from these countries. The probable overall effect of even the most draconian limits in the advanced countries, without matching restrictions in at least the prosperous exempt countries, is thus that the increased population will lead to an atmospheric concentration of CO2 in 2100 that is greater­ than it would be without the artificial increase in energy prices. In the unlikely event that further research confirms the theory of anthropogenic global warming, the misguided countermeasures now proposed would mean that we will bequeath to our descendants a grim, dirty, crowded, decaying world that is actually slightly warmer than it will be if we encourage global economic growth and, in particular, make sure that energy remains cheap. *The data are from International Energy Statistics published by the DoE EIA. Instead of or in addition to the emission permits created by the Waxman-Markey cap-and-trade bill, fuel suppliers could buy "carbon offsets" from people who took action to reduce CO2 emissions. For example, a factory that decided to meet part of its energy needs by installing solar panels could sell offset certificates that would allow the buyer to emit as much CO­2 as the solar panels saved. In theory, this would reduce the cost of the solar installation, encouraging its adoption, although it would of course mean that the CO2 "saved" would be emitted somewhere else. Waxman-Markey permits offsets amounting to more than a third of US emissions in 2008, split between domestic and international projects. Under the Kyoto Protocol, the similar provision allowing purchase of offsets from exempt countries is called the Clean Development Mechanism (CDM). The ostensible purpose is to encourage these countries to undertake voluntary reductions in emissions. In practice, it must be expected that virtually all proposed projects that have a small carbon footprint will be depicted as eliminating CO2, thus creating an asset that can be sold to some company in an Annex I country (i.e., in one of the advanced nations that are supposed to reduce their emissions). In those cases where the project was contingent on selling the offset, the transaction will transfer funds from the buyer to the seller, without any reduction at all in overall emissions. If the project would have gone ahead anyway, without the offset, the net effect would be to permit the buyer to increase global emissions. Third World leaders will be sorely tempted to announce wholly imaginary carbon-intensive projects and then refrain from them, for the specific purpose of conjuring up imaginary emission savings that can be sold as offsets. In practice, the market price for offsets, and hence for carbon credits, will be determined by competition between the perpetrators of such scams. The principal effect will be to transfer funds from consumers in Annex I countries to the Swiss bank accounts of Third World kleptocrats, while reducing the effectiveness of the cap-and-trade program in curbing emissions. The Global Warming True Believers at the Climate Change Conference in Copenhagen in December, 2009 were well aware that the CDM is vulnerable to abuse. The problem they face is that the obvious profit potential of the CDM is the primary if not the only reason that most Third World leaders pay any attention to climate change. Their countries are exempt from any climate-related obligations under existing or proposed treaties, so the whole subject is essentially irrelevant to them unless it can be used to extract benefits from the Annex I countries. Instead of accepting constraints aimed at reducing corruption of the CDM, they actually demanded more money, as what they called Climate Justice – i.e., reparations from the advanced nations to compensate them for all the damage we have allegedly done to the climate in the past. Unsurprisingly, the Conference then collapsed. The one nation, one vote rule in the UN General Assembly and in the Intergovernmental Panel on Climate Change means that both these organizations are controlled by the Third World. Their delegates are unlikely to authorize continued expenditures on the subject if the proposed solutions do not offer them lucrative revenue streams. Keeping the money coming is thus crucial to maintaining the international clamor over the need to curb CO2. I predict that Climate Justice will become the preferred justification for transferring funds (bribes?) to Third World leaders. Reparations would presumably be government expenditures, which means that Global Warming ideologues and their tame politicians could influence the behavior of the recipients. The CDM involves possibly corrupt negotiations between individual companies and officials in exempt countries. The long-term results are unpredictable, but would almost certainly include scandals that weaken popular support. I wintered in Antarctica long ago. I was a NASA scientist astronaut during Apollo. I worked for Peter Glaser, inventor of the Solar Power Satellite, during the original NASA/DoE study, and have been involved in the subject ever since. See my post entitled Biographical Note for more detail.